It was one of the breakthroughs of the year 2010: Laser spectroscopy of muonic hydrogen resulted in a value for the proton charge radius that was significantly smaller, by four standard deviations, than previous determinations using regular hydrogen. This discrepancy and its origin have attracted much attention in the scientific community, with implications for the so-called Standard Model of physics. 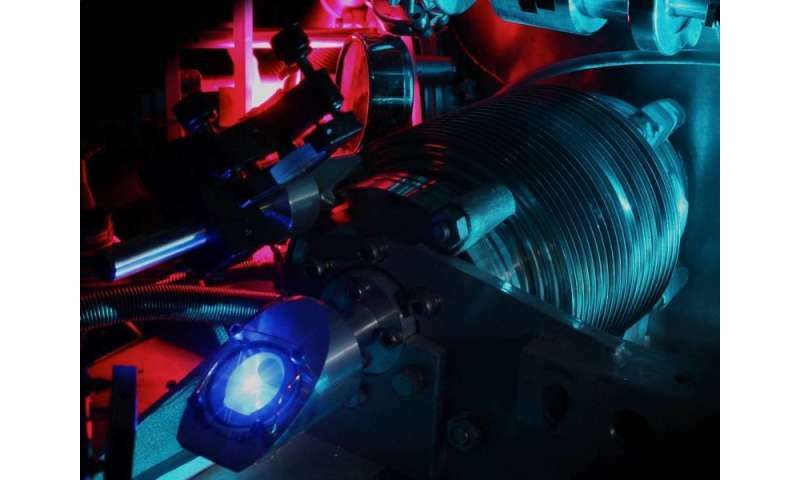 Now, a team of scientists from the Laser Spectroscopy Division of Professor Theodor W. Hänsch at the Max Planck Institute of Quantum Optics in Garching has made a new spectroscopic measurement of regular hydrogen (Science, 6 October 2017). The resulting values for the Rydberg constant and the proton radius are in excellent agreement with the muonic results (Nature 466, 213 (2010)), but disagree by 3.3 standard deviations with the average of the previous determinations from regular hydrogen. Hydrogen is the simplest of all chemical elements. According to the model proposed by Niels Bohr in 1913, it consists of a single proton and an electron orbiting around it. The theory of quantum electrodynamics predicts the energy levels of this system with 12 digits of precision. Because of this, hydrogen plays a key role in our understanding of nature. Its study allows the determination of fundamental constants such as the Rydberg constant and the proton charge radius. Hydrogen is thus the ideal subject for testing the laws of nature. This is why a measurement on muonic hydrogen, resulting in a surprisingly small value for the proton charge radius, made big waves in 2010. In that experiment, done at the Paul Scherrer Institute in Villingen, Switzerland, the electron of the hydrogen atom is replaced with its sister particle, the 200-times heavier and short-lived muon. Laser spectroscopy of this muonic hydrogen resulted in a value of the proton radius that was extremely precise, but four percent smaller than previous measurements on regular hydrogen. "Since the muon is 200-times heavier than the electron, it orbits much closer to the proton and 'feels' its size," explains Prof. Randolf Pohl (now at Johannes Gutenberg-Universität Mainz), a member of the MPQ team. "Because of this, the proton radius has a seven orders of magnitude larger influence on the spectral lines than in regular hydrogen. This allows us to determine the proton radius with such a high precision." The large discrepancy between the measurements of regular hydrogen and its exotic cousin has sparked many debates about its origin. "However, some of the previous measurements in fact agree with the muonic value. The influence of the proton radius on the energy levels in regular hydrogen is tiny, and even very high precision measurements struggle to resolve it. The discrepancy only becomes significant when all measurements are averaged," explains Lothar Maisenbacher, one of the graduate students working on the project. "This is why, to solve this 'proton radius puzzle', new individual measurements with high precision, and, if possible, using different experimental approaches are necessary." In order to determine both the Rydberg constant and the proton charge radius from spectroscopy of regular hydrogen, two different transition frequencies need to be measured. The by far sharpest resonance, the so-called 1S-2S transition, serves as a corner stone in this determination. Its frequency has been measured, in 2011, to 15 digits by the MPQ team (Phys. Rev. Lett. 107, 203001 (2011)). This high precision was made possible not least by the invention of the frequency comb, for which Professor Hänsch was awarded the Nobel Prize in Physics in 2005. For the second frequency measurement needed, the MPQ team chose the so-called 2S-4P transition, which connects the metastable 2S state with the much shorter lived 4P state. In the experiment, this transition is excited by a laser with a wavelength of 486 nm and the collected fluorescence from the decay of the 4P state serves as a signal. The apparatus used previously for the 1S-2S measurement serves as a source of atoms in the 2S state. Compared to previous experiments, which used room temperature atoms, the atoms probed here have a substantially lower temperature of 5.8 Kelvin and, consequently, a much lower velocity. This, together with especially developed techniques, strongly suppresses the Doppler shift, which constitutes the largest source of uncertainty for this measurement. "Another source of uncertainty in this experiment is the so-called quantum interference," explains Lothar Maisenbacher. "If we could probe a single, isolated transition, the shape of the resulting spectral line would be symmetric. However, in our case there are two other upper states that can be excited by the laser, called 4P1/2 und 4P3/2. This results in a slightly asymmetric shape of the spectral lines, making the determination of the line center more challenging. While this is a very small effect, it plays a big role for us because we determine the line center with such a high precision of almost one part in 10,000 of the line width." To describe the influence of the quantum interference, the scientists performed sophisticated numerical simulations, which are in very good agreement with the experimental results. "In our case, however, a specially derived, simple fit function is sufficient to remove the effects of quantum interference," emphasizes Vitaly Andreev, also a graduate student on the project. "We use this fit function for our data evaluation. In this way, the simulation is only needed for small corrections on the order of 1 kHz." With this, the MPQ team managed to determine the frequency of the 2S-4P transition with an uncertainty of 2.3 kHz. This corresponds to a fractional uncertainty of 4 parts in 1012, making this the second-best spectroscopy measurement of hydrogen after the aforementioned 1S-2S transition measurement. Combining these results, the Rydberg constant and the proton size are determined to be R∞ = 10973731.568076(96) m-1 and rp = 0.8335(95) fm, respectively. "Our measurement is almost as precise as all previous measurements on regular hydrogen combined," summarizes Prof. Thomas Udem, the project leader. "We are in good agreement with the values from muonic hydrogen, but disagree by 3.3 standard deviations with the hydrogen world data, for both the Rydberg constant and the proton radius. To find the causes of these discrepancies, additional measurements with perhaps even higher precision are needed. After all, one should keep in mind that many new discoveries first showed up as discrepancies." It may be that the Muon is constantly "making a measurement" by feeling its nearer proton. So the physicists measurement is a bit more "particle like" compared to the harder to measure, slightly more "wave like", and so marginally larger, proton of ordinary hydrogen. If this is true: Then it could illuminate our understanding of the Copenhagen interpretation; by indicating a softer transition from 'wave like' to 'particle like' behaviour than we expected. Are the protons actually different in size? or is it just a difference in measurement acuity of muon vs electron...? Alternatively, the positively charged quarks could just be attracted outwards more, by the closer muon, making the composite proton bigger. Wrong: That would be the opposite result ! Don't the measurements represent a smaller proton radii? No they didn't; the proton has no boundary conditions. It's a Field Center! Go figure. Why you are here and glass is transparent. Anyway, QM is not precise by definition and is not causal so any measurement is questionable, i.e. it only defines wavelets. Our instrumentation is limited. The article did not clarify whether the Standard Model makes a prediction of the proton charge radius, and if so, how that prediction compares with the new and old experimental values mentioned here. "... some of the previous measurements in fact agree with the muonic value"
Kudos to them. But what did they do 'different' ?? Nik, My take is that the previous measurements were taken with an electron present, vs the heavier muon. might that not indicate the electron is a varying field around the proton....? @Whydening Gyre, how could it be possible to replace the electron on H with a particle with 200 times greater mass and not have it affect the size of the H atom? The proton charge radius has not so far been calculated ab initio from the SM, and can't be because we don't know enough yet about quark-gluon interactions to do so anywhere near the precision we can measure it to. Color force interactions are extremely complex and require enormous amounts of computer time; and that's only for an approximate simulation. Lattice QCD is possible for simpler simulations, but at that size and speed, we still don't have the math to do it. In response to a few others, no, the muon does not increase (@Eyen made a mistake and immediately corrected it) or decrease the charge radius of a proton. The charge radius of a proton is what it is; this is just a new measurement method that's more exact and confirms data collected using muonic hydrogen with measurements of normal electronic hydrogen. The two measurements were previously in tension with one another (that is, they conflicted and are now resolved). Perhaps the old value is a classic case of false consensus effect, but now there is a new locus and the consensus will shift accordingly. Charge is dimensionless, it occupies all of space; it's a field! Protons are conglomerates of particles that add up to having a positive charge. They are not analogous to leptons. They have 3 quarks and then you have additional gluons constantly getting exchanged between them. Protons are more particle than wave, they are a stable state of the combination of a lot of forces, not simply charge. "Perhaps the old value is a classic case of false consensus effect, but now there is a new locus and the consensus will shift accordingly." It's certainly served notice that, despite best efforts, *some* of the workers were getting 'systematic' errors. Time to re-visit such, hopefully spot the source(s). @Somone. Because I see the electron as more of an energy shell than particle that surrounds the proton. The muon does the same thing but at a denser energy level. By example... would an earth pressure atmosphere(less dense like an electron) on Venus make Venus bigger? These calculated figures may be (and probably are) incorrect. The electron and the proton are electrical charges and are therefore susceptible to Coulomb forces. The Coulomb force varies inversely with distance, so it acts like nonlinear spring that produces force of attraction (for unlike charges) and repulsion for like charges. The diameter of the hydrogen atom is 1.04 pm, so the radii of the electron and proton are much smaller. Measuring the size is quite difficult due to the effect of Coulomb force, and this makes these claims difficult to verify since the measurement affects the resulting data. The electrical properties of the muon will have similar effects, plus the differences in masses that produce the counter forces.